For The Record: What's the Right Direction for Your EHR Project? What’s the Right Direction for your EHR Project? The pressure is on for all physicians to begin planning a move from paper charts to an EHR within the next five years in order to qualify for funding from the American Recovery and Reinvestment Act (ARRA). 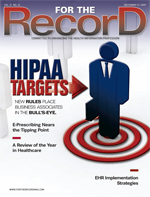 Failure to implement an EHR in this time frame will lead to reduced Medicare payments. Fortunately, there are many ways to accomplish the transition. Some practices may partner with local hospitals or health systems while others may implement their own systems. There are no easy answers and each option has multiple details, benefits, and drawbacks. The challenge facing individual physicians and small group practices is weeding through the many offerings to find the system that best fits the practice’s workflow and the end users’ requirements. The benefit of selecting a system for an individual practice is that the EHR usually can be customized to fit the practice’s unique workflow process. The downside is that it takes time and expertise. In any case, the system selected must be officially “certified” to be eligible for ARRA funding. EHR vendors have historically had a difficult time downsizing their systems to meet the needs of smaller practices. Some vendors develop products that are said to be “scalable” and can meet the needs of both small and large practices. This is not always the case, making it essential to obtain vendor references from clients of a similar size. • Is the vendor financially viable? • How does the vendor provide ongoing support after the initial implementation? • What happens if the vendor goes out of business? Who provides assistance in that circumstance? • Is the product being demonstrated the “go-forward” product, or is there a chance or even a plan in place to phase out the product under consideration? • Does the vendor have both hardware and software technical support available 24/7? This is especially important if you are in a different time zone or if you offer services after normal business hours or on weekends. • Is the contract straightforward and clear? Can your practice perform the due diligence? If not, consultants can handle this function. For example, one physician’s office was paying a yearly tech support fee but using the service only once or twice per year. A consultant negotiated a per-use fee and saved the practice more than $1,000 annually. Before reaching out to a hospital, consult with an attorney who can familiarize your practice with the Stark law, which deals with such business relationships. If your local hospital or health system agrees to a partnership, the practice most likely will not have the freedom to select the EHR system. The needs of an individual physician practice rarely factor into a hospital’s overall selection process. At best, a practice may be offered the choice of more than one system, but even then it is likely these options will be limited to the offerings of one particular vendor. Bear in mind that most local hospitals or health systems may not have expertise or experience in managing IT for physician practices. Often these smaller practice systems are very different from the systems used in larger facilities. Before electing to partner with a hospital or health system on an EHR, make sure your partner understands how a physician’s office works. Many vendors extract elements of an EHR that they have sold to a hospital and offer that to individual practices. This solution is often fraught with problems and operational issues. If the vendor has small practice-specific solutions, then providers are looking at a win-win situation. Customization will be less flexible since the system will have to be a part of a larger whole. Partnering with a hospital or health system may also limit a practice’s level of integration with other facilities in the community. A hospital cannot prohibit a practice from integrating its system with those of other facilities, but it does not necessarily need to participate in that integration. This will place the burden of that integration on the practice. Integration projects are among the most difficult—with the limited technical resources available to a small practice, it is at best ill advised and at worst impossible. Outside help, extra budget, and patience are the paths to a win-win in this situation. A significant benefit of forming a partnership is that the EHR is likely to be well integrated into the hospital’s information systems, enabling the principals to exchange data. Ideally, the two systems will share laboratory results, clinical documentation, and even order entry functionality. New York’s North Shore-Long Island Jewish Health System, the third largest in the country, has benefited from developing partnerships with area practices. Associate Chief Medical Officer and Chief Quality Officer Kenneth J. Abrams, MD, MBA, says there’s a simple reason behind the arrangement: It’s the right thing to do. “True healthcare reform is only going to take place at the healthcare delivery level,” he says. From its infrastructure budget, North Shore has set aside up to $40,000 per physician to join its system, in addition to the $44,000 stipend from ARRA. Data elements in the EHR system must remain noncustomizable so that everyone in the network can share quality data. To meet that goal, North Shore’s EHR vendor offers individual products geared toward different types and sizes of practice specialties. Although partnering, if available, can reduce the risk of implementing a system independently, it doesn’t come without some cost. By going it alone, practices can select a system that best fits their needs and avoid a general system that may not meet all their requirements. Even if practices can’t partner with a large health system, there are other ways to reduce risk, including sharing resources with other physicians in the community. Smaller practices that come together can often find that the costs of their systems and support are lower than if each practice purchased its own system. Using outside, nonvendor-affiliated consultants can also reduce risks. The issues surrounding the implementation of any EHR technology, no matter how it’s accomplished, are many and often technically complex. There may be meetings in which it sounds as though attendees are speaking a foreign language. Having a partner who can translate and help make technology decisions can make for a smoother EHR implementation. — Sandra Holtzman is the founder and president of Holtzman Communications and a partner in the EHR Empowerment Consortium. — Todd Frech is senior partner at Ocius Medical Informatics and a partner in the EHR Empowerment Consortium.